1967 誰在敲我的門 Who's That Knocking at My Door J.R.
1990 - Two Evil Eyes（英语：Two Evil Eyes） Roderick Usher 片段："The Black Cat"
2014 - Rio, I Love You（英语：Rio, I Love You） 他自己（O Ator） 片段："O Milagre"
1966 - Hogan's Heroes（英语：Hogan's Heroes） German Soldier 集數："The Great Impersonation"
1968 - N.Y.P.D.（英语：N.Y.P.D. (TV series)） Ramby 集數："Case of the Shady Lady"
1971 - Great Performances（英语：Great Performances） Jerry 集數："A Memory of Two Mondays（英语：A Memory of Two Mondays (film)）"
1973 - Kojak（英语：Kojak） Jerry Talaba 集數："Siege of Terror"
1974 - The F.B.I.（英语：The F.B.I. (TV series)） Ernie 集數："Deadly Ambition"
1985 - Amazing Stories（英语：Amazing Stories (TV series)） Byron Sullivan 集數："Vanessa in the Garden"
1986 - The Ellen Burstyn Show（英语：The Ellen Burstyn Show） Frank Tanner 集數："Reading Between the Lines"
1988 - The Play on One Carl 集數："Down Where The Buffalo Go（英语：Down Where The Buffalo Go）"
2002 週六夜現場 Saturday Night Live Siegfried 集數："Robert De Niro/Norah Jones"
2016 艾米·舒默的內心世界 Inside Amy Schumer Proposition Man 集數："Fame"
^ Karen Schoemer. 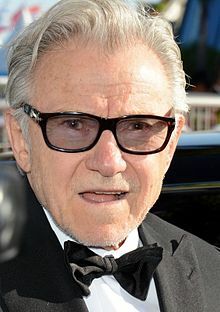 Harvey Keitel Tries A Little Tenderness. The New York Times. 1993-11-07 [2009-06-21].